92% of Asia and the Pacific’s population – about 4 billion people – are exposed to levels of air pollution that pose a significant risk to their health. 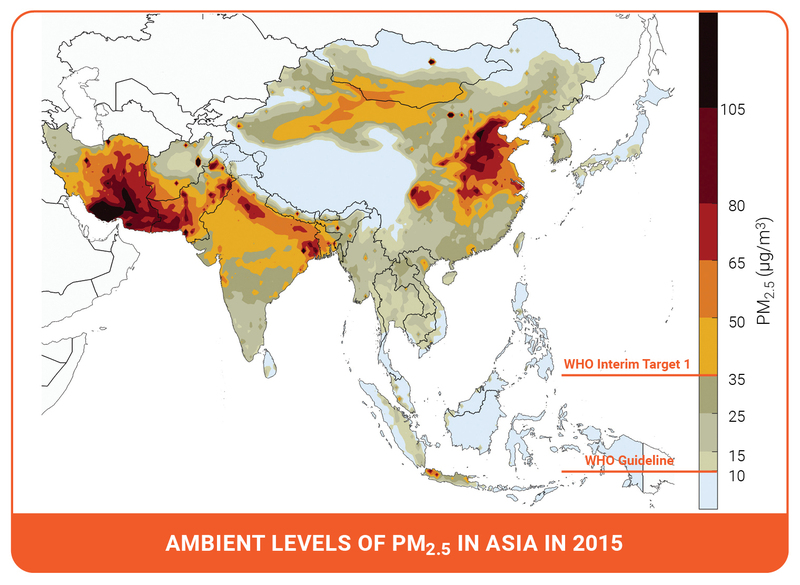 Air pollution in the Asia Pacific region is not only a major health risk, it also has damaging impacts on the environment and agricultural crop yields. These impacts have significant economic consequences, affecting economic growth as well as welfare. While existing laws and policies have made progress in reducing air pollution in the region, further action is needed to bring air quality to safe levels. A new report, Air Pollution in Asia and the Pacific: Science-based solutions, presents the first-ever scientific assessment of air pollution across 23 countries in the region. Using world-leading scientific models, the report outlines 25 policy actions that could achieve safe air quality levels for 1 billion people by 2030 – with numerous benefits for public health, economic development and the climate. 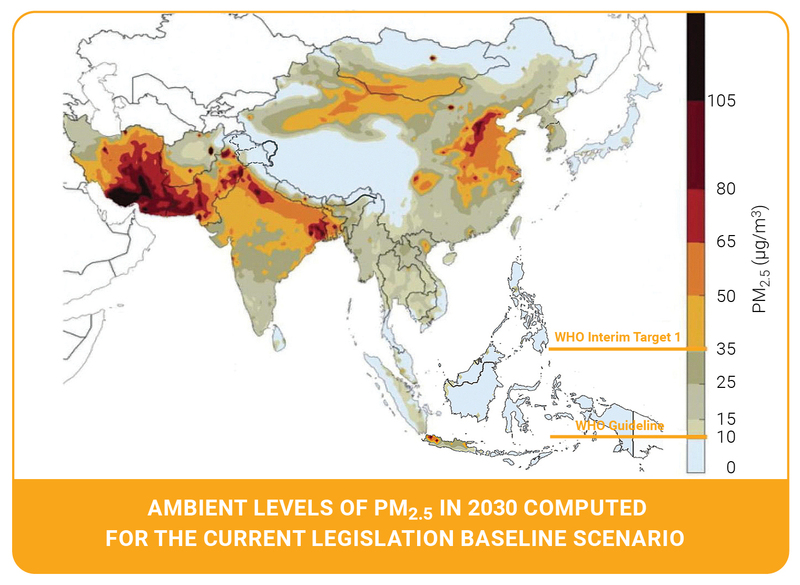 2.3 billion people in the region are exposed to levels of air pollution several times the WHO guideline for safe air. While the sources of these pollutants vary by country, they are linked to only a handful of activities. Urban and heavily industrialized areas with high population densities have the highest levels of air pollution. 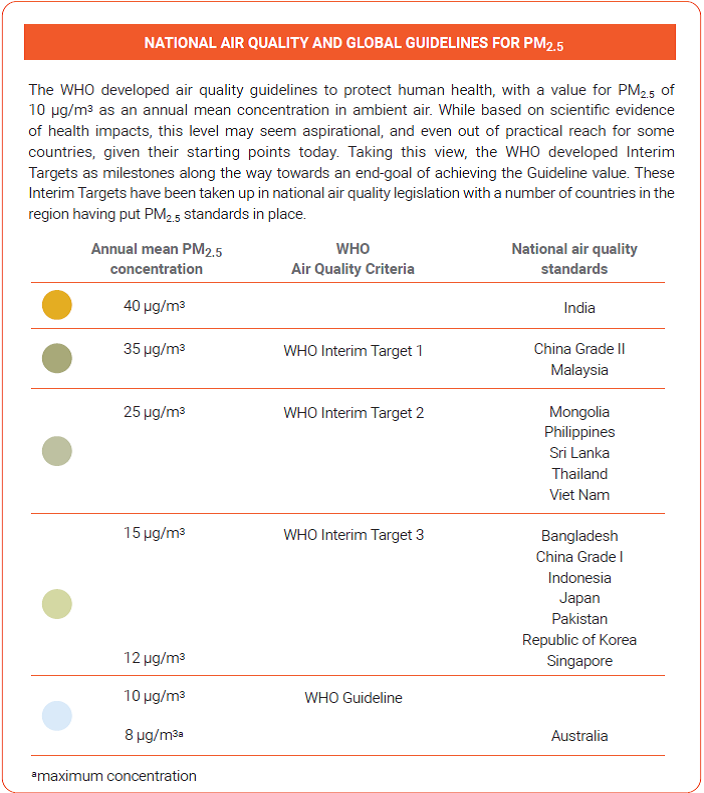 In 2015, the majority of global deaths from ambient (outdoor) air pollution - 35% - occurred in East Asia and the Pacific. About 33% occured in South Asia. In addition to its impacts on human health and well-being, air pollution also threatens agricultural productivity and food security in the region, which is home to approximately 60% of the global total of undernourished people. Without existing policies, population-weighted exposure to harmful particulate matter would grow by more than 50% by 2030 based on projected economic growth of 80% over the same period. If current policies aimed at limiting emissions are effectively enforced, air pollution in 2030 will remain at 2015 levels, leaving over 4 billion people exposed to health-damaging levels of air pollution. An additional 650,000 people in the region could enjoy clean air by 2030 if a package of 25 Clean Air Measures is implemented starting today. 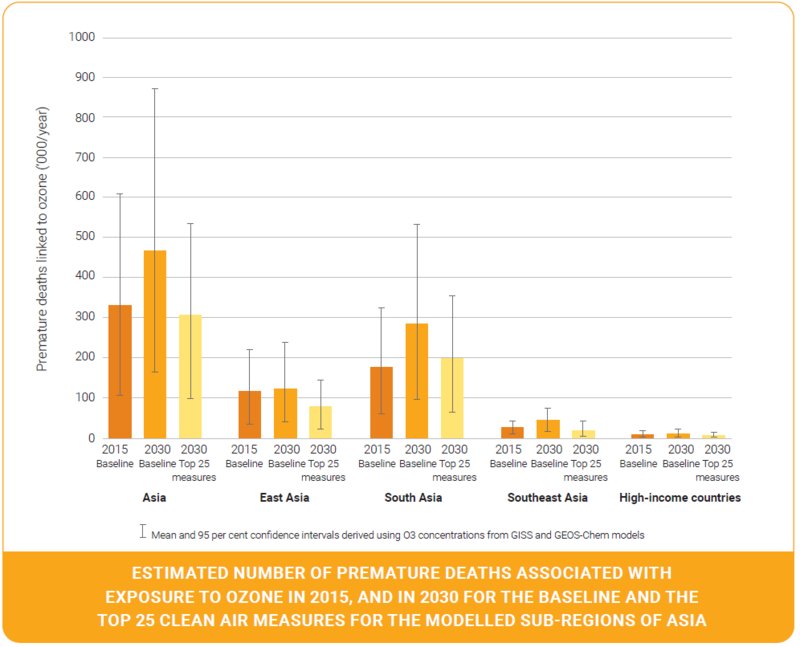 Air Pollution in Asia and the Pacific: Science-based Solutions uses the highest quality data available and state-of-the-art modelling to identify the most effective 25 measures to reduce air pollution. Conventional emission controls focusing on emissions that lead to the formation of fine particulate matter (PM2.5). 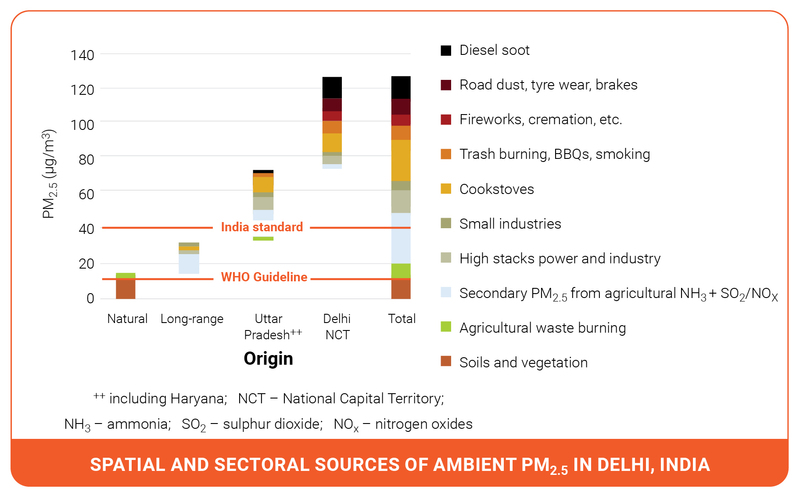 Further (next-stage) air-quality measures for reducing emissions that lead to the formation of PM2.5 and are not yet major components of clean air policies in many parts of the region. Measures contributing to development priority goals with benefits for air quality. Industrial process emissions standards: Introduce advanced emission standards in industries, e.g., iron and steel plants, cement factories, glass production, chemical industry, etc. 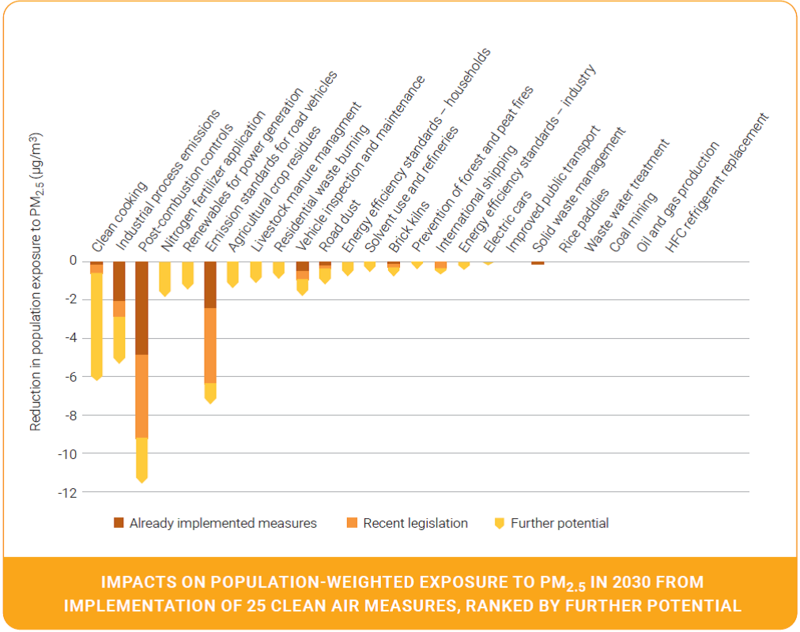 Implementing the 25 measures in this report would have numerous benefits beyond improved air quality. Carbon dioxide emissions in 2030 could be reduced by almost 20% and methane by 45%. This would decrease the expected warming by a third of a degree Celsius by 2050 and would be a significant contribution to the Paris Agreement target of keeping global temperature rise this century well below 2ºC. 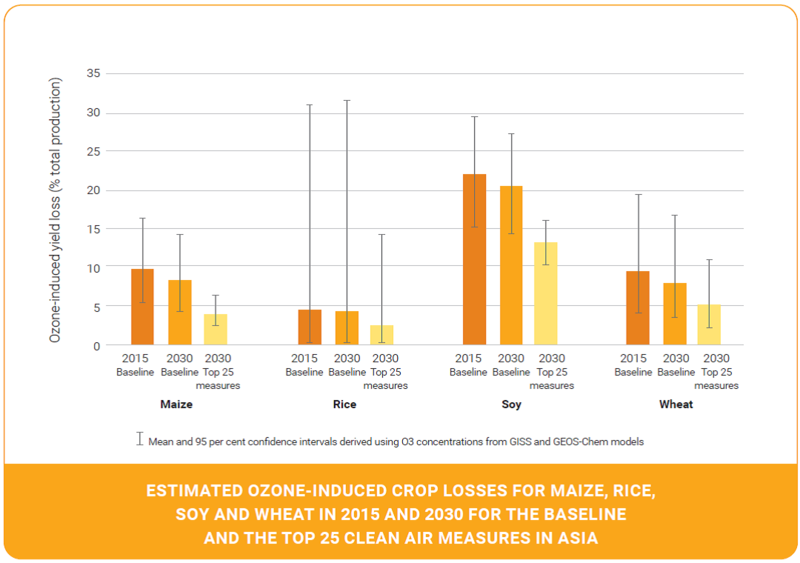 Ozone-induced crop losses could be reduced considerably – by 45% for maize, rice, soy and wheat combined. The health of natural ecosystems would also improve. Reduced nitrogen and sulphur deposition to ecosystems would have benefits for water and soil quality, as well as biodiversity. One billion people could breathe clean air that meets stringent World Health Organization (WHO) standards by 2030. 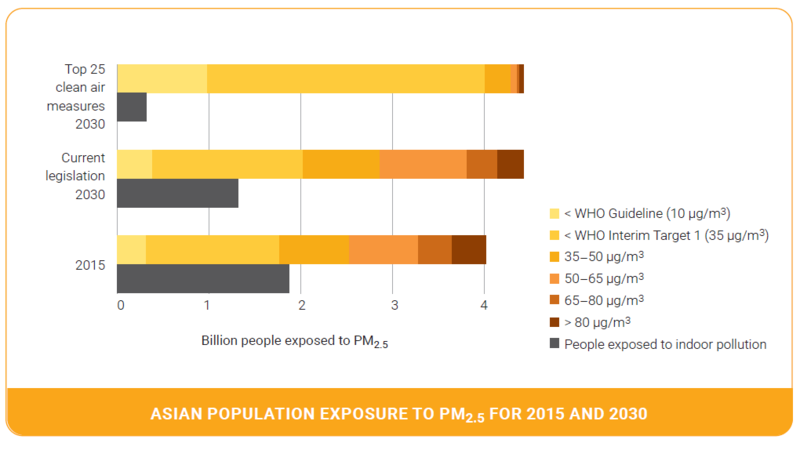 The number of people exposed to pollution above the highest WHO Interim Target could fall by 80% to 430 million. Furthermore, premature mortality from outdoor air pollution could decline by about a third, and an additional 2 million premature deaths a year from indoor air pollution could be avoided. A reduction in particulate emissions would slow the melting of glaciers and snowfields, reduce the risk of disasters related to glacier lake outburst floods, and help mitigate water insecurity for billions of people.